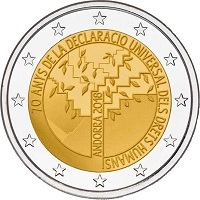 Andorra, together with Latvia, joined the Eurozone in 2014. The standard coins have themes relating to the wild life as wll as the buildings of this small mountain country. Some basic facts relating to Andorra. A Pyrenean chamois and an indigenous vulture for the 1 cent, 2 cent and 5 cent coins. The church Santa Coloma for the 10 cent, 20 cent and 50 cent coins. Casa de la Vall for the 1 Euro coin. 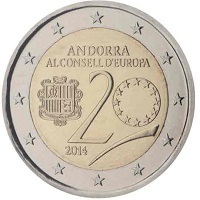 The Andorran Coat of Arms and national Motto for the 2 Euro coin. 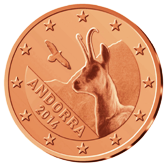 1 Cent - Pyrenean Chamois and indigenous Vulture. 2 Cent - Pyrenean Chamois and indigenous Vulture. 5 Cent - Pyrenean Chamois and indigenous Vulture. 10 Cent - The Curch of Santa Coloma. 20 Cent - The Curch of Santa Coloma. 50 Cent - The Curch of Santa Coloma. 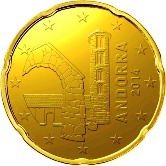 2 € - The Andorran Coat of Arms and national Motto. 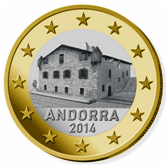 Andorran Commemorative Two Euro Coins. 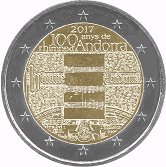 Andorra has been quite productive and in the 5 years in which it has been a member of the Eurozone and has already issued 8 commemorative coins. 2014 - 20th anniversary of joining the council of Europe. 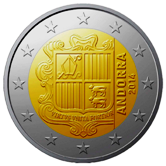 In the inner circle we see the coat of arms of Andorra plus an artistic 20. Although the coin was minted in 2014 it was only issued in 2016. 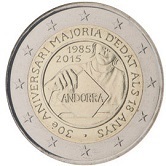 2015 - The second Andorran coin to be minted in 2015 but which was only issued in 2016.It commemorates the 25th anniversary of joining the EU customs union. 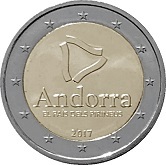 2016 - The first Andorran issued in the same year it was minted! It commemorates the 25th anniversary of the founding of Andorra's own televion and radio station. 2016 - The coin commemorates the 150th anniversary of the reform of 1866 which among other things dealt with voting and elections. 2018 - 25th Anniversary of the establishment of the Andorran Constitution. 2018 - 70th Anniversary of the declaration of Human Rights. 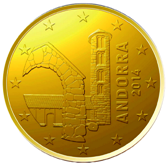 Return from Andorran Euro Coins to Links to Specific Countries. 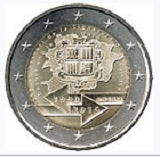 Return from Andorran Euro Coins to euro coin collector.